One of the most prolific bloomers of all Clematis! produces two types of flowers, the old wood will produce doubled pink two-toned flowers while the new growth produces large single blooms with the same coloring. Clematis are the most popular of all hardy vines. Thay are fast growing and produce an exceptional amount of bloom. 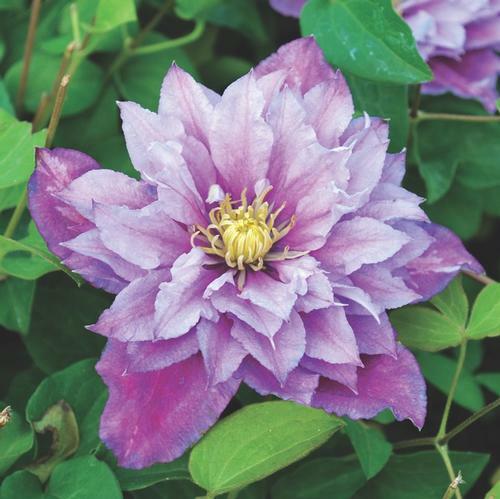 Clematis come in a wide range of flower colors, sizes, shapes, heights and bloom times. Cleamtis are very long-lived and benefit from proper site selection where they can be left undisturbed for years. Most require a support structure, such as a fence or trellis, to which thay can attach. Plant: Clematis prefer a neutral soil, pH 5.7 - 6.4. Center in pot and plant crown 1-2" below the soil surface. Spread spiralling roots evenly throughout soil. Trellis: Position trellis at time of planting to prevent root and stem damage later. Pinch: Pinch sprouted clematis back to 2 sets of leaf pairs per stem. This will promote better branching and produce fuller containers. Inspect crop regularily and keep growing shoots trained to the trellis to prevent tangling and damage. Grow: Grow in full sun at 55 - 60F minimum night temperatures. After growth appears, fertilize with 200 ppm Nitrogen every 7 - 10 days. Water: Keep evenly moist. To prevent diseases, water early in the day and keep foliage dry. Site Selection & Planting info: For best flowering, select a site that is well-drained with a minimum of 4 hours of sunlight per day. Clematis prefer their roots to be cool. If planted in full sun, surround clematis with perennials or smaller shrubs that provide shade to the crown area. Homeowners should plant their potted clematis so the crown is 2 - 4" below soil level. Keep moist and fertilize regularily.